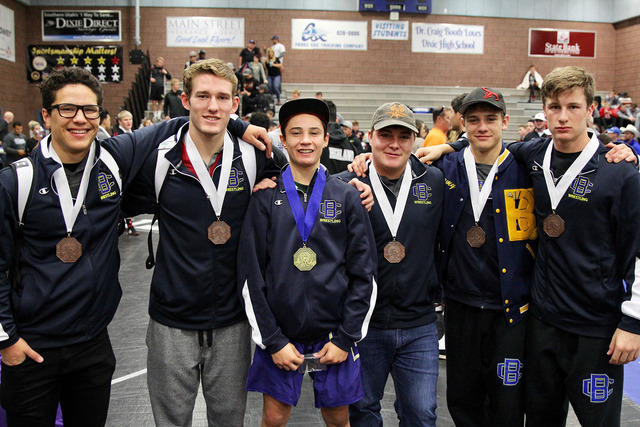 The Boulder City High School wrestling program is starting to come into its own as a powerhouse, taking fourth place at the Dixie Desert Storm tournament in Utah out of 32 teams, one week after its 11th-place finish at the 53rd annual Jimmy Hamada La Costa Classic in California. Laura Hubel/Boulder City Review Boulder City High School junior Jin Takahashi, wrestling at 182 pounds against Donovan Rosenthal of Las Vegas High School, won by fall in a stunning 26 seconds Dec. 15. Photo courtesy Richard Viera Celebrating their wins at the Dixie Desert Storm tournament in Utah on Saturday were, from left, Bryan Foster, 170 pounds, third place; Dillon Viera, 160 pounds, fifth place; Garrett Leavitt, 113 pounds, first place; Devin Fox, 220 pounds, fifth place; Jimmy Brown, 132 pounds, fourth place; and Jimmy Dunagan, 152 pounds, fifth place. Finishing behind only Desert Hills, Canyon View and Millard, the Eagles were led by junior 113-pound wrestler Garrett Leavitt, who took first place during the event. Seniors Bryan Foster (170 pounds) and Jimmy Brown (132 pounds) took third and fourth place, respectively, while seniors Dillon Viera (160 pounds), Devin Fox (220 pounds) and junior Jimmy Dunagan (152 pounds) all placed fifth. For consecutive weeks Brown, Dunagan and Fox made it to the podium at prestigious tournaments, with the trio placing first, eighth and 12th at the Jimmy Hamada La Costa Classic last week. Concluding the Eagles’ efforts at Desert Storm, sophomore Mike Kaposta (275 pounds) and freshman Ladd Cox (138 pounds) both finished 2-2, while senior Octavian Trumbo (145 pounds) and junior Zayne Dennington (120 pounds) each finished 1-2. The night before rebounding nicely in Utah, the Eagles suffered their first loss of the season to 4A opponent Las Vegas 35-33, but provided a great showing to suggest that it is among the teams to beat in the 3A classification. 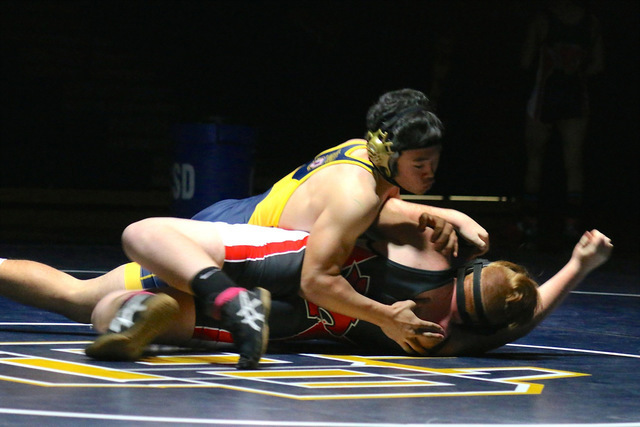 Performing in front of a crowd sitting in a blacked-out gym and holding glow sticks, 182-pound Japanese foreign exchange student Jin Takahashi earned the highlight of the night, getting a fall in only 26 seconds against the Wildcat’s Donovan Rosenthal. Also picking up victories against the Wildcats were Foster, Dennington and Leavitt, along with freshman Curtis Brown (106 pounds) and junior Ryan Vanarrio (195 pounds). Taking off the holiday break, the Eagles will return to action Jan. 6 for the Pahranagat Valley Invitational in Alamo, Nevada.